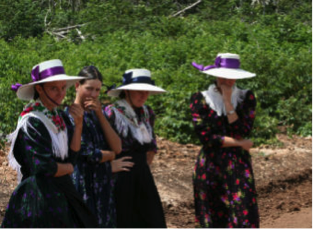 In Latin America, Low German-speaking Mennonites live on colonies which are large tracts of land reserved exclusively for Mennonites. Colonies are divided into villages and villages into individual family farms. Each village has a school and churches are scattered throughout the colony. There is a high degree of organized mutual aid on colonies which is directed towards orphans, poor members of the colony and colony members who have experienced a disaster like a fire. When Mennonites migrate to Ontario from Mexico and other parts of Latin America, they are leaving behind a fundamentally different way of living. Colonies are religious communities even as they are economic and social ones. The formal aspects of religious life are expressed in church activities, but the very fabric of daily colony life is religious as well. At the heart of religious life for colony Mennonites is a commitment to be separate from the society around them and to live distinct lives. 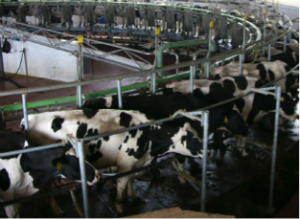 The colony ideal is for each family to be largely self-sufficient with a dairy herd and land on which to grow cash crops. This lifestyle that a colony sustains is the expression of colony Mennonites’ commitment to live separate and distinct lives. 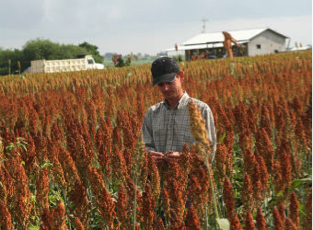 However, NAFTA and other trade agreements have made the ideal increasingly difficult to achieve (if it ever was) and many colony Mennonites support their families through wage paying jobs. Dairies that produce cheese, village stores, and manufacturing companies (often related to the agricultural sector) are some of the more common employers on Mennonite colonies. It is common for sibling’s shirts and dresses to be made of the same fabric. Colonies are, to a large extent, homogeneous in terms of the population. 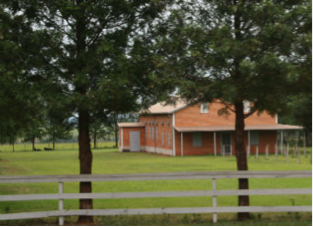 Only Mennonites are allowed to own property on a colony and very few outsiders (such as Mexicans) live on a colony. A high degree of uniformity is maintained on a colony. For example, fashion for both men and women is prescribed, the interior of houses are decorated in similar ways. Within families, there is considerable flexibility in the division of labour. 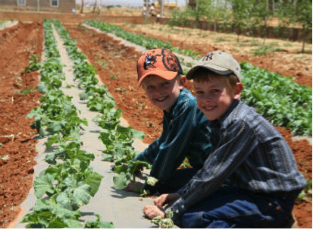 Maintaining a subsistence agrarian and self-sufficient lifestyle is difficult without large families. Traditionally, the family is an economic unit, with responsibilities often divided along gendered lines. Women and girls attend to the domestic side of family life and men and boys take responsibility for the hard physical labour of farm life and the public aspects of farming, e.g. business dealings. Within individual families, there can be considerable flexibility in the division of labour depending on the family make up and the economic status of the family. Children work alongside their parents and older siblings. Children learn the skills needed to perpetuate the primarily agrarian colony lifestyle by working alongside their parents and older siblings all the while contributing to the wellbeing of their family. This model of learning instills in children the importance of their presence in the family. In this integrated family environment, children are taught to respect their parents and older siblings. As in North America, when teenagers “hang out” with their friends and neighbors, matches are made. Once colony children finish school (from ages 12-14) they are given greater responsibility in the family. Most teenagers are capable of carrying out the duties and tasks that their parents do in the family setting. This is essential if they are to manage their own households and farms when they marry. Adolescence is also the time of life when most colony Mennonites meet their future spouse. On Sunday afternoons and sometimes on week night evenings, groups of teenagers socialize on the village street. As they “hang out” with their friends and neighbors, matches are made. 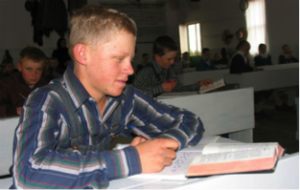 Marriages usually take place for Low German speaking Mennonites between the ages of 18 and 22. If parents have the financial wherewithal, they will support their newly married children by providing housing, often on the parental yard or on a neighboring property. As they age, members of the colony want to feel productive as long as possible. Elderly parents are cared for by their adult children. The arrangements that are put in place depend on the number of children and the financial means of the children. Sometimes parents live with their adult children, even moving from child to child. Other times the family of one child will live near a parent to provide care. Grandchildren play an important role in caring for the elderly whether it is caring for livestock, keeping the house clean, or spending time with their grandparents. 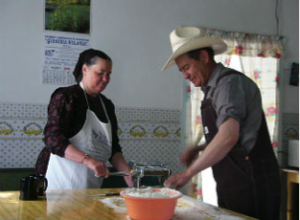 Several colonies in northern Mexico have established senior care homes. The Bible, the Catechism and the hymnbook are the 3 most important texts. Village schools are important institutions in the perpetuation of colony life. In school, children learn to read and write and do basic arithmetic. School is also preparation for the church life they will participate in as adults. It is here that they are familiarized with the three most important religious texts used by colony Mennonites: the Bible, the Catechism (statement of beliefs) and the hymnbook. As these are all printed in blackletter (often called gothic) script, children also learn to read and write this script. Learning is largely done by rote. Formal participation in church life begins when children complete school (between the ages of 12 and 14). Formal participation in church life begins when children complete school (between the ages of 12 and 14). In most instances, individuals are baptized once they are ready to marry. Baptism is an important religious and social ritual for colony Mennonites. By being baptized, Mennonites express their commitment to the values, beliefs and practices of their community and are deemed ready to contribute as adults to that community. Some colonies, particularly those in northern Mexico, have modernized significantly in the last few decades. 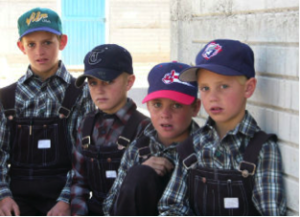 While most colonies espouse more simple technologies than Canadians are accustomed to, colony life is not static; colony Mennonites are not stuck in the past. Some colonies, particularly those in northern Mexico, have modernized significantly in the last few decades. As part of this modernization, the influence and authority of the Old Colony Church has diminished as other groups, often more evangelically-minded Mennonites, have established churches that are more open to progress. These colonies are now more diverse than they used to be. Other colonies resist embracing advanced technology and other aspects of modern life because they know that such changes will fundamentally alter the fabric of colony life and the values and beliefs that sustain it.